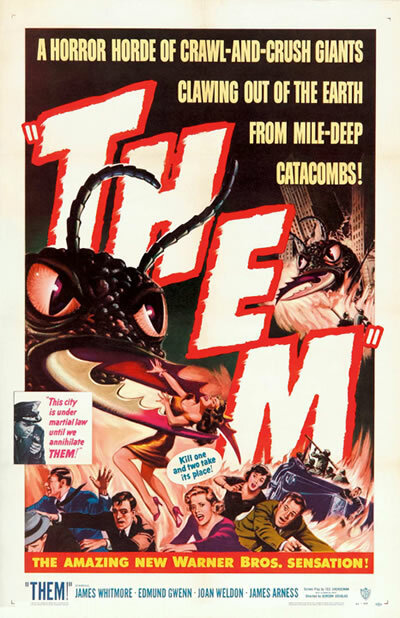 In an era of suspicion about the atomic age, came a film that would shape the world of creature features and B-movies for many years to come and one that still has influence today on many a film. That film was the Warner Brothers’ feature THEM! A film that is a sci-fi classic from an atomic age. The story starts with reports of something being spotted out in the deserts of New Mexico. Sgt. Ben Peterson (James Whitmore – The Shawshank Redemption) with aid of a local desert airplane spots something working towards them, a little girl. The girl is still in her dressing gown, holding on tight to her broken toy doll in a catatonic state, just staring out into space. Ben Peterson carries the girl back to his patrol car, where his partner calls it in. Moments later they get another call in from the desert plan, reporting a car and trailer camper just a few miles up the road. At reaching the site Ben and his partner find that the trailer, which belonged to the family of the little girl, has been ripped open leaving a huge hole in the side leaving damage and debris everywhere. On closer inspection they find a number of clues, which may lead to finding out what happened here, a strange animal print in the sand and sugar spread around the scene. Ben and his partner head on to a local store, where again the find that a large hole has been ribbed open from the outside and the inside of the store has been destroyed with sugar again being seen as primary source for the break in. More concerning is that the find the owner dead and thrown down into the stores caller. Ben’s partner stays behind as he goes of to get more help, unaware that the killer or killers are about to strike again, leaving his partner as the eventual victim. With the death count rising the local authorities call in an agent from the F.B.I. , Robert Graham(James Arness – The Thing from Another World and Two Lost Worlds) and experts from the Department of Agriculture, Dr. Harold Medford(Edmund Gwenn – Miracle on 34th Street and Between Two Worlds) and Dr. Patricia Medford(Joan Weldon). With experts on hand, the mystery of the killings is explained and the true horror of what lies ahead is revealed. During atomic testing in the New Mexico Deserts a mutation had occurred and created giant ANTS! These ants now live out in the desert in a giant nest that must be found and destroyed before they kill again. A plans is devised and our team heads out to find the nest. From the air, Patricia Medford spots the nest and the rest of team swing into action with bazookas, flame throwers and poison gas. The team then enters the nest to make sure that their job is complete. However, on inspection they discover eggs, some of which that have hatched queen ants. These queen ants now could be anywhere as they have the ability to fly. Where have these queen ants gone? Will they set up new nests? Will humanity be able to survive these giant beasts if they do? With the government now monitoring the airwaves and investigating any reports of unknown phenomena and the country now put under martial law, the hunt is on to find these flying monsters before it is too late. A film that has influenced countless creature features and has become a benchmark of 1950s science fiction, this film in my eyes is the best of its type, with Tarantula! a close second behind it. With good acting and a solid storyline, Them! shows what was possible if these to ingredients are put together for 1950s sci-fi film and one that still stand the test of time today. The flamethrowers used in the movie were standard World War 2 weapons and were loaned by the US Army. The actors handling the weapons were WW2 combat veterans who had actually used them in battle.